$100 One Hundred Dollars - Most counterfeited money denomination in the world. Keeps the world moving. Ten Thousand Dollars - $10,000 - Enough for a great vacation or to buy a used car. Approximately one year of work for the average human on the planet, and about half a years' work after taxes for the average US citizen. 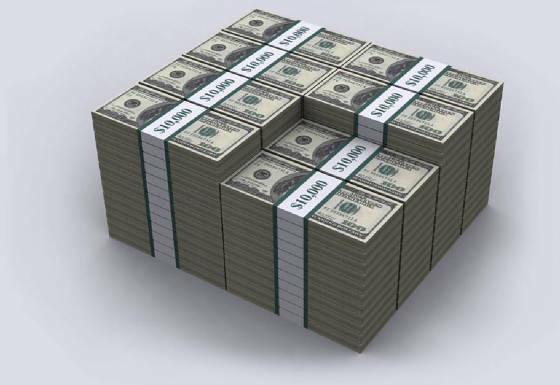 One Million Dollars - $1,000,000 - Not as big of a pile as you thought, huh? Still this represents 92 years of work for the average human on earth and it weighs an astonishingly 22 pounds. 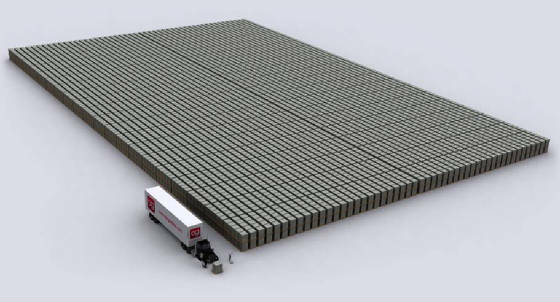 One Hundred Million Dollars - More than 1 ton of money - $100,000,000 - Plenty to go around for everyone. Fits nicely on an ISO / Military standard sized pallet. One Billion Dollars - 100 tons of money - $1,000,000,000 - You will need some help when robbing the bank. Too heavy to carry by yourself. Now we are getting serious! 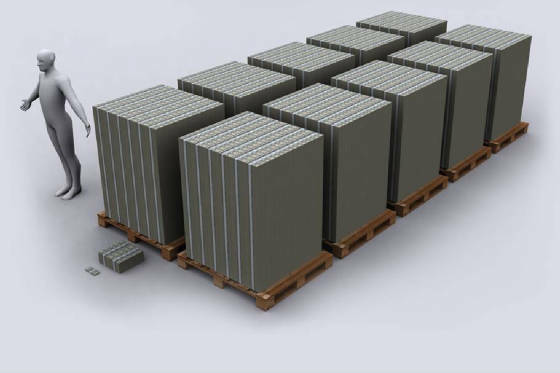 One Trillion Dollars - note the pallets are double stacked! - $1,000,000,000,000 - When the U.S government speaks about a 1.7 trillion deficit - this is ONLY the amount of cash the U.S. Government BORROWED just in 2010 to run itself. 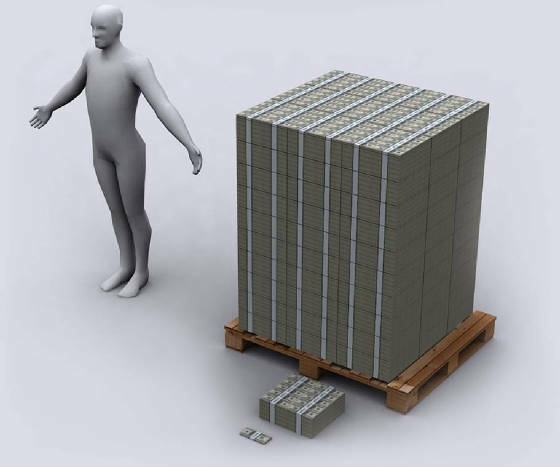 Keep in mind these are double stacked pallets of $100 million dollars each full of $100 dollar bills. You are going to need a lot of trucks and a large workforce to freight this around. If you spent $1 million a day since Christ was born, you would not have spent $1 trillion as of today...but only ~$700 billion - same amount the banks got during the bailout. Comparison of $1,000,000,000,000 dollars to a standard-sized American Football field and European Football field. Say hello to the Boeing 747-400 transcontinental airliner that's hiding on the right. This was until recently the biggest passenger plane in the world, and it would take more than ten Boeings to move this amount. 15 Trillion Dollars - $15,000,000,000,000 - US national debt (credit bill) just topped $15 trillion 2 months before Christmas 2011. Three years ago it was $10 trillion. Statue of Liberty seems rather worried as United States national debt passes 22% of the entire world's combined GDP (Gross Domestic Product). In 2011 the United States National Debt exceeded 100% of GDP, and foolishly ventured into the 100%+ debt-to-GDP ratio that the European PIIGS now lay claim to (bankrupting nations). $114,500,000,000,000. - US unfunded liabilities - now it gets frightenly interesting! 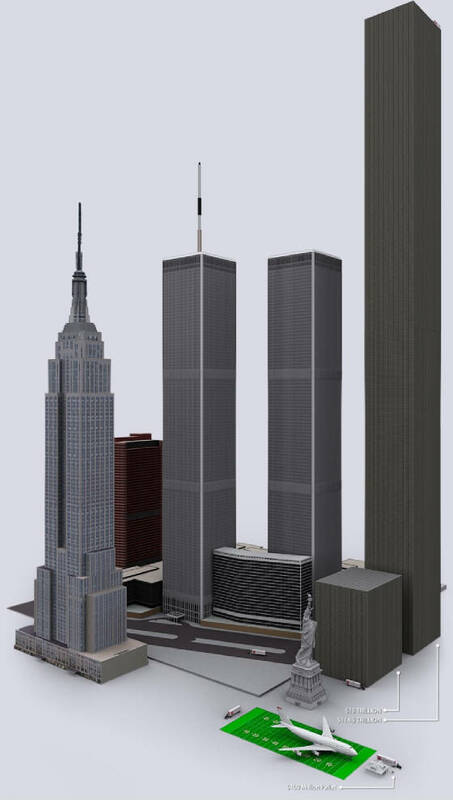 To the right you can see the pillar of cold hard $100 bills that dwarfs the WTC & Empire State Building - both at one point, the world's tallest buildings. If you look carefully you can see the Statue of Liberty dwarfed by our "unfunded liabilities." The unfunded liability (money we owe the government, which is not shown anywhere on government books) is calculated on current tax and funding inputs, and future demographic shifts in US Population, and includes, in addition to the programs outlined below such as Medicare, Medicaid, etc., monies owed to US Government Retirees. These retirees include 23 million retired military personnel, 3.5 million retired civilian government workers, 1 million miscellaneous NGA retirees and half a million retired Postal workers, who will each draw up to 75% of what they earned while actively working for the government, where many positions pay over $175,000 a year. However, there is an exception to these retirement pensions - retired Congress people and retired presidents, who have a different retirement program, which allows them to retire with multi-million dollar pensions for serving as little as one two-year term. Fortunately for we the people, there are only about 1000 of these retirement packages we have to fund, of course, off the books of the government. The 114.5 Trillion dollar super-skyscraper is the amount of money the U.S. Government does not have to fully fund Medicare, Medicare Prescription Drug Program, Medicaid, Social Security, Military and civil servant pensions, including the multi-million dollar retirement packages of Congress. It is the money the USA knows it will not have to pay all its bills today, without including Obamacare. If you live in USA , 114.5 Trillion dollars is also an IOU on your personal credit card bill; you are responsible, along with everyone else, to pay this back to the government. The citizens of USA created the U.S. Government to serve them, this is what the U.S. Government has done to the people while "serving them!" 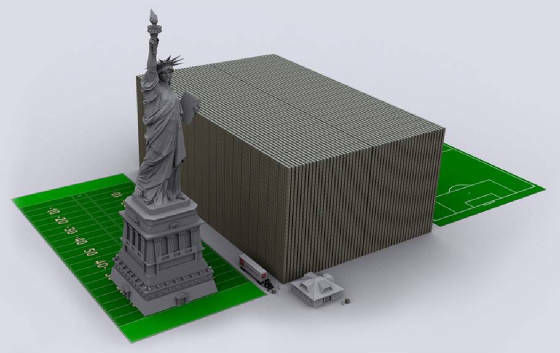 Note: On the above $114.5Trillion image, the size of the base of the money pile is half only a trillion dollars, not $1T as on 15T image. The height is double the WTCs, and was done to more closely resemble the the bases of Empire State building and WTCs...Bottom line...We are all in an "unsustainable," or maybe a better description, "disastrous" financial condition, where each of us owes over $3,270,000 to the government in unfunded liabilities.